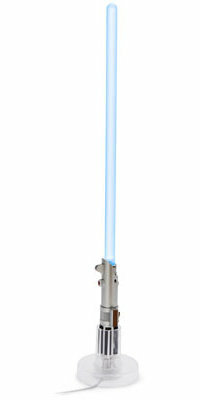 This is different from the Lightsaber Lamp that we saw in the past, and it is also another variation of the USB Lightsaber Lamp that we came across a few years ago as it seems to be way more refined, as though crafted by a master Jedi instead of a bungling padawan. Measuring over a foot long, it can be set in its base, where it will automatically juice up while emitting a soft, blue glow that ought to introduce some Zen-like Jedi moments at the office. It retails for $25.99 a pop, but too bad it cannot be used to cut down annoying co-workers.